Police are monitoring the area at 108-47 67th Dr. where a two-story home was destroyed on Nov. 25. 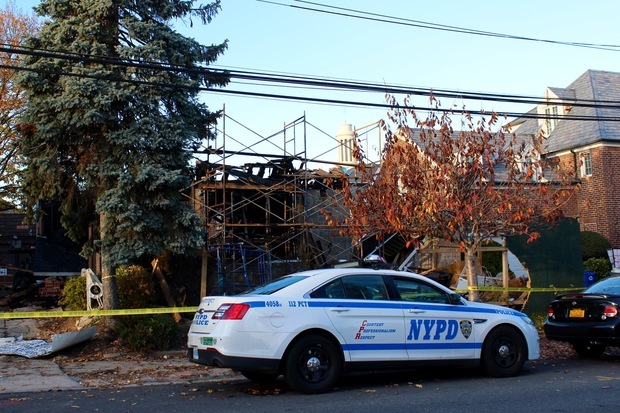 QUEENS — The "ninja" police believe set at least four suspicious fires in the past month in Forest Hills may have left an encoded note with a riddle near the site of the most recent blaze, police sources said. The note included a riddle as well as a section with various symbols and letters, sources said. The author indicated that if investigators cracked the code, they'd have their man. “Decode this message to find out the person who caused the fire,” the note discovered about four blocks from 108-47 67th Drive which erupted into fire shortly after 11 p.m. last Wednesday read, sources said. It didn't take long for detectives to decipher the code, which revealed the name of someone who lived near where the fires had been set, sources said. Law enforcement officials are currently looking to speak with that person. Police are now also offering a cash reward of up to $2,500 for information leading to the arrest of the suspect. Last Friday, police released video footage of the suspected arsonist during the latest blaze. A neighbor also saw a man in his 30s wearing all black in the area shortly before the fire erupted, sources said. The fire at 108-47 67th Drive is one of seven recent suspicious blazes in the neighborhood. Fire marshals and police investigators have determined that four of them were acts of arson. 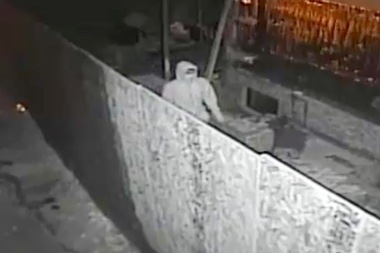 Investigators probing the fires also have surveillance video showing a man “looking like a ninja,” wearing all black and carrying a backpack, entering a construction site during another incident — on Nov. 17 at 108-49 66th Ave. — that has also been ruled an arson, as first reported by DNAinfo.com New York last week. The other two fires that investigators determined were deliberately set broke out on Nov. 8 at 68-60 112th St. and on Nov. 15 at 112-35 69th Road, police said. In all four arson cases, the suspect entered the sites and ignited flammable combustibles, before fleeing on foot, according to the NYPD. No injuries were reported in any of those incidents, although two of the fires spread to nearby homes. All the recent suspicious fires broke out at vacant buildings that were being renovated or under construction. Most of them were clustered in the area between Jewel and 65th avenues and between Queens Boulevard and the Grand Central Parkway. The FDNY did not immediately respond to an email seeking comment.